Promising three-year-old Habitual Offender has raced his way into Derby contention for trainers Michael Moroney & Chad Ormsby following a gutsy all-the-way win in the Houston Medical 2100m at Ellerslie on Saturday. The progressive gelding has now won two of his five career starts and will be back at Auckland's premier racecourse on March 1 for a tilt at the $750,000 TV3 New Zealand Derby, for which he is rated a $31 chance. 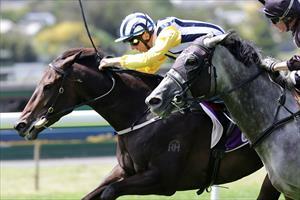 "Everything has fallen into place nicely and there is a good sense of timing about him, co-trainer Chad Ormsby said. "He's currently 18th on the order of entry, with quite a few above him unlikely to start. I thought it was a really strong performance on Saturday and I am confident he will stay the mile-and-a-half of the Derby. "He's tactically versatile, given he can push forward like he did on Saturday, or sit off them if there is good speed." Well-rated by in-form rider Craig Grylls on Saturday, Habitual Offender will have the services of Leith Innes in the Derby. "Craig has opted to ride Lucky Feather in the Derby, which was a surprise to me, but we certainly lose nothing with Leith taking the mount," Ormsby said. Habitual Offender is raced by Auckland property tycoon Mark Wyborn and Robin Peel-Walker, with the duo having long-held ambitions of winning a Derby. "Paul Moroney Bloodstock purposely bought a small selection of horses as Derby types as it is a race Mark is really keen to win," Ormsby said. "He's got two three-year-olds and a couple of two-year-olds with the stable and I am really pleased that he has a runner with a live chance."